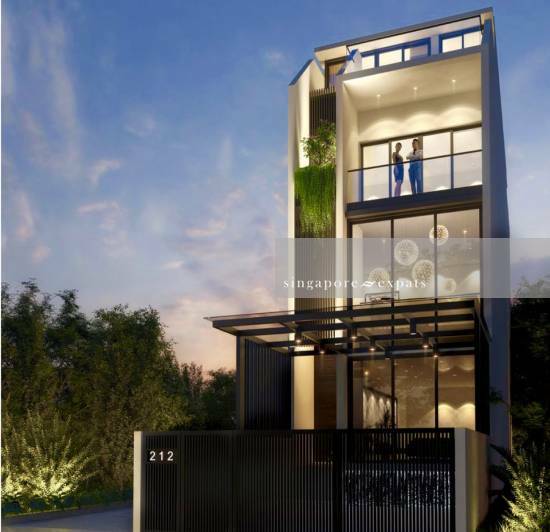 Newly developed Freehold 3-Storey Intermediate Terrace (with Attic & Roof) for sale at No. 212 Carpmael Road. Elegant and modernly designed property with a land size of 1718sqft and built comprises of 167976sqft (1st storey) + 1055sqft (2nd storey) + 1076sqft (3rd storey) + 1076sqft (attic) + 1076sqft (roof). Has 5 bedrooms (with attached bathrooms) + 1 maid’s room (with unattached bathroom) + 1 powder room, lift and 1 carpark lot. Estimated for TOP on 4th quarter of 2019. Strategically located near amenities such as 112 Katong, The Odeon Katong, Katong Shopping Centre, Paramount Shopping Centre, various eateries spots, government primary and secondary schools.